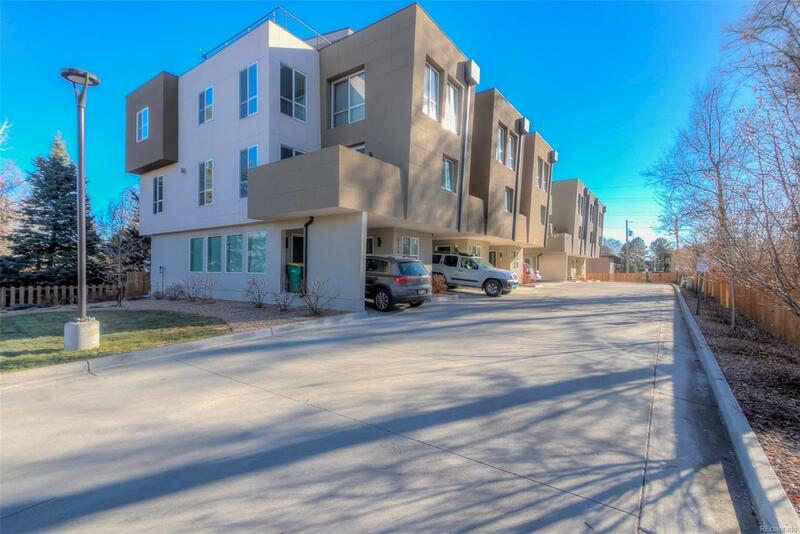 Swanky Near New Townhome with Mountain views from your rooftop deck. Tons of natural light. Contemporary finishes. Quartz Counter Top, Stainless Appliances, Stainless restaurant style faucet, Hunter Douglas Honeycomb style Window Coverings, Deep Double Sinks, Grey Cabinets with Soft Close Doors, , Warming Gas fireplace, Glisten Wood Floors, Recessed Can Lights, Modern Light fixtures, Faucets, vanities and the Like! Entry with built in Storage Cuby/bench Seat. Tile Entry, Coat Closet, Modern Railing, Trex Decking, Master alcove, luxurious Carpeting, 5 Piece Master bath with Dual Sinks, Deep Soaking tub, Slate Tile Shower, Glass Shower door, Modern vanity with Soft Touch Close Doors New, Guest bath with Subway Tile, tile Floors, Walking Distance to Light Rail Station on 9th Ave and Wadsworth! Minutes to Downtown. Ez Access to the Mountain, Shopping at Walmart.Starbucks just opened at 10th & Wadsworth. Convenient to light rail. Oversized garage with adjacent storage/workshop.